I know I've been talking about a lot of pregnancy/stretch mark creams, but I can't help it! My biggest fear for my skin now that I'm preggers is stretch marks! I'm already seeing them start to form, and I'm freaking out. I have heard from other bloggers (including my favorite blog, DulceCandy) the best cream to use is from Mama Mio. "The yummiest, purest, creamiest, melt-in-your-skin butter we could possibly make. Mama Mio pregnancy skincare products work because of their very high levels of Omega 3, 6 and 9 to ensure your skin has the best fighting chance against pregnancy stretch marks. One scoop and you'll know our Tummy Rub Butter deserves every award and accolade it has won. It smells gorgeous, makes you feel gorgeous and is a pleasure to use"
Tummy Rub Stretch Mark Butter ($35) is primarily designed for one thing, increasing skin elasticity. You will grow, you will shrink, your skin doesn't have to suffer! This is packed rich in omegas and it smells amazing! Shea Butter: The most potent healing and nourishing butter with natural latex to lock in moisture and improve elasticity. Gravida: The oil fragrance that makes this stuff smell sooo good. A blend of 10 pregnancy safe aromas. I use this all over my torso and bottom half to achieve perfect firming skin with no sign of any stretch marks in sight. This is perfect for before you start to get any stretch marks, and for when you already have them. Plus it comes in such an adorable little tub! Celelbs that love Tummy Rub Stretch Mark Butter include Sarah Michelle Gellar, Jessica Alba and Claudia Shiffer. And I don't think they have a stretch mark in sight! Before I found Mama Mio I was using Mederma, which is ok as well, but the smell was a bit too harsh. Mama Mio's products have the smell of a citrus lotion, and your friends will think you just have a fabulous cream on instead of tummy butter! 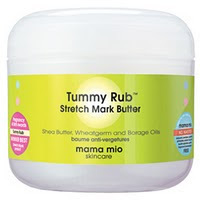 You can purchase Tummy Rub Butter at MamaMio.com and I plan on buying this two at a time! It sells for $35 for a 4oz jar. I wonder if they sell it by the case? Nice post, thanks for sharing this wonderful and useful information with me. I love this stuff, I haven't seen a single stretch mark on my body and I'm now 8months pregnant and it doesn't smell gross like all the other leading brands.